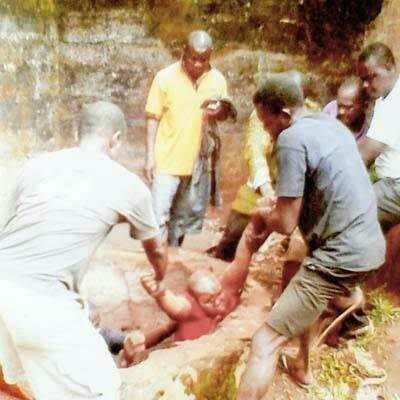 A man identified as Ejike Nwankwo Ohagba from Ezigbo village, Igbo-Ukwu com­munity, Aguata Local Govern­ment Area of Anambra State on Thursday, April 7, went crazy and threw his mother into an abandoned well in his father’s compound. He then threw blocks into the well to kill her. According to Anambra State news, the 30-year-old suspect had earlier in September 2015 allegedly killed two of his siblings in the same well, set his family house ablaze and disappeared only to re­appear last week to kill his mother. Chiemerie spotted the suspect and alerted the deceased. Chiemerie escapedbut unfortunately, the deceased could not as the suspect attacked her, Sunday Sun reports. “After wrestling with him to free herself in vain, she was thrown into the well by the suspect who went ahead to gather blocks and started throwing them into the well to ensure that she did not survive. They said it was Chiemerie who reported the attack on them to other members of the community after running for a distance from the scene of the incident. The traditional ruler of Igbo-Ukwu community, Igwe Martin Eze, Idu of Igbo-Ukwu, who confirmed the tragic incident said he was shocked, adding that the case has been reported to the police. While urging the federal and state governments to set up rehabilita­tion centres in many communities where people could be rehabili­tated when they begin to exhibit unusual behaviour, he also said that jobs should be created to get the youths employed to reduce the level of hardship which he noted was responsible for increase in crime in the society. When contacted, the Police Public Relations Officer (PPRO), Mr Ali Okechukwu, a Deputy Su­perintendent of Police said he was yet to confirm the incident.